Unai Emery says Arsenal could recruit up to two players before the January transfer window closes on Thursday. Inter Milan's Ivan Perisic handed in a transfer request at Inter Milan after Arsenal had a loan offer rejected for the winger, while Barcelona midfielder Denis Suarez has also been linked. 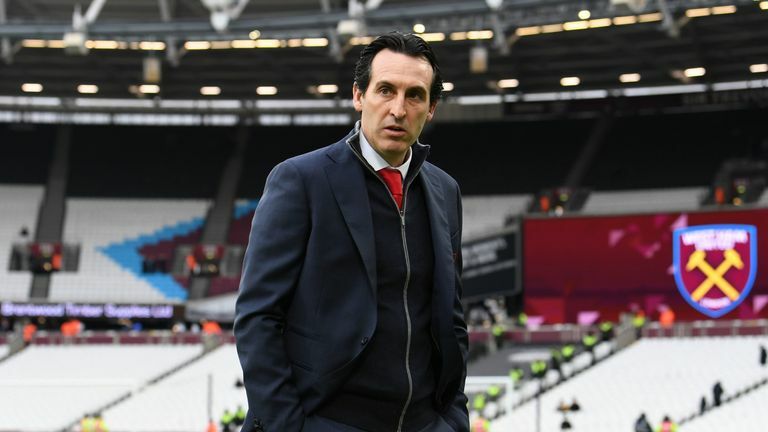 Emery, who would not be drawn on specific names, said: "This transfer [window] is not easy and the message is the club is working on different players and the possibility if it can be is good for us. "We are looking at two different players and the possibility they can come. If they aren't coming to help us like we want, I prefer they don't come." There's a bumper midweek Premier League schedule and you can watch goals from every game on your mobile with Sky Sports. Despite both Sokratis Papastathopoulos (ankle) and Laurent Koscielny (jaw) suffering injuries in their FA Cup defeat to Manchester United on Friday, Emery is reluctant to sign defensive reinforcements this month. "We have enough players, centre-backs in the squad. Only we're having a lot of injuries and a lot in this position," said Emery, speaking ahead of Tuesday's Premier League match against Cardiff. FA Cup: Who made the most changes? The France international will miss the Cardiff fixture, but could be back for Sunday's trip to Manchester City, live on Sky Sports.